It takes a small army of local residents volunteering their time, money and vehicles to cook, serve and deliver the annual Thanksgiving meals. Shown are just a few of those volunteers at last year’s event at Wendy’s on Rombach Avenue in Wilmington. WILMINGTON — This is the 24th year for the Clinton County Community Thanksgiving dinner held at Wendy’s Restaurant on Rombach Avenue Thanksgiving Day. Last year, over 2,000 dinners were prepared and delivered to Clinton County residents. This would not be possible without the help of many volunteers and monetary donations. Volunteers can help by donating money, volunteering at Wendy’s, and delivering the meals to residents. To volunteer call Arlafaye Carnahan at 937-382-2706, Tari Mabry at 937-218-2232, or Lorry Swindler at 937-218-6119. Donations can be sent to Jo Ann Bartram in care of Wilmington Savings Bank, 184 N. South St., Wilmington, OH 45177. To make reservations (delivery or eat-in), please call Arlafaye at 937-382-2706, Denise at 937-382-7058, or Terri at 937-527-6627. Reservation deadlineis Nov. 19. Delivery is limited to Clinton County. 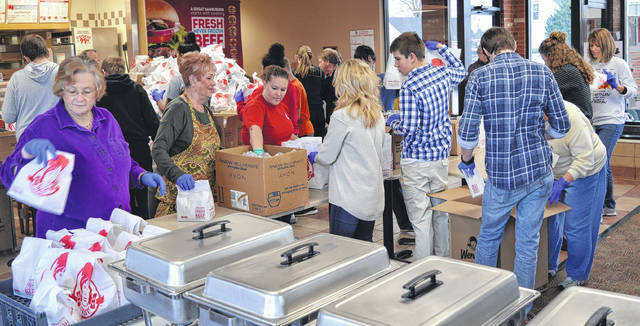 Meals are served at Wendy’s Restaurant from 11:30 a.m. to 1 p.m.
https://www.wnewsj.com/wp-content/uploads/sites/22/2018/11/web1_DSC_0161.jpgIt takes a small army of local residents volunteering their time, money and vehicles to cook, serve and deliver the annual Thanksgiving meals. Shown are just a few of those volunteers at last year’s event at Wendy’s on Rombach Avenue in Wilmington.